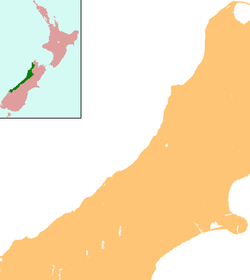 Whataroa is a small township in southern Westland on the West Coast of New Zealand's South Island. It is located on the western bank of the Whataroa River, with the village of Te Taho on the other side. State Highway 6 passes through Whataroa on its route from Ross to the Franz Josef Glacier. Hari Hari is 31 kilometres (19 mi) to the north-east, and Franz Josef is 32 km to the south-west. The population of Whataroa and its surrounding area was 288 in the 2013 census, a decrease of 117 from 2006. Whataroa is located in an agricultural area where dairying is the primary activity. The town contains establishments such as a school, two churches, and a Māori craft gallery. It is also a staging base for trips to a white heron sanctuary that is the only breeding location of white heron in New Zealand. Te Taho, a small farming community, is located north of Whataroa on State Highway 6. It once included a maternity hospital and a number of schools. Whataroa hosts the South Westland A&P Show annually in February. Founded in 1951, events include equestrian competitions, dairy cattle judging, dog trials, trade displays and various family entertainment. The Woodham Shield is an annual rugby competition in which Whataroa and neighboring towns, Franz- Fox- Hast, Hari Hari and Ross, compete against each other for possession of the shield. Whataroa was the site of cattle sales twice a year from 1875, serving farmers from around South Westland. The last mob of cattle was driven to Whataroa in 1961. A dairy factory was established at Whataroa before World War I.
Whataroa School is a coeducational full primary school (years 1-8), with a decile rating of 7 and a roll of 37(as at August 2018). The school was established in 1879 and celebrated its 125th reunion in 2004. Whataroa sits on the Alpine Fault, a seismically active area. In 2017 scientists reported they had discovered beneath Whataroa "extreme" hydrothermal activity which "could be commercially very significant". ^ Roger Smith, GeographX (2005). The Geographic Atlas of New Zealand. Robbie Burton. map 173. ISBN 978-1-877333-20-0. ^ "Whataroa - Westland District Council". Archived from the original on October 14, 2008. Retrieved 2008-08-10. ^ McCormack, Trish. "Gunn, Mabel Winifred". Te Ara: The Encyclopedia of New Zealand. Ministry for Culture and Heritage. ^ Rogers, Anna (2005). Illustrated History of the West Coast. Auckland: Reed Books. p. 66. ISBN 978-0-7900-1022-9. ^ "Historic Haast to Paringa Cattle Track". Department of Conservation. Retrieved 2008-08-10. ^ "Directory of Schools - as at 13 September 2018". New Zealand Ministry of Education. Retrieved 22 September 2018. ^ "About our school". Whataroa School. Archived from the original on 2011-07-24. Retrieved 2008-08-10. ^ Geothermal discovery on West Coast Otago Daily Times, 18 May 2017. This page was last edited on 16 March 2019, at 04:09 (UTC).